“I have read with fascination the galleys of Uncommon Sense authored by my dear friend Rabbi Ganz. This work’s citation of profundities of classical Rabbinic literature and keen analysis opens new vistas through which to view and understand the pressing societal issues which confront us on a daily basis. This is not a quick read, but it is nevertheless readily comprehended, intellectually stimulating and emotionally satisfying. The following was written on Sunday, June 9, 2013 by Doug Johnson, a much respected and decorated writer and thinker, owner of the widely followed http://www.horsesenseblog.com/ . For those who read my writing on a regular basis, they will know that I don’t tend to write book reviews. In fact, this is the first time I have done that here. However, the book I am about to tell you about had such an impact on me that I felt I owed it to you to tell you about it. So, you won’t see the usual Nonsense and Horse Sense in this post. Rather, I just want to tell you about this great book and recommend you read it. Rabbi Ganz has written a book in Uncommon Sense that is a must read. While the book is short and essentially a quick read, the wisdom he articulates in the book is worth spending some time contemplating. As a Christian the foundation of my faith is based on the books of my Bible (the Old Testament, as we Christians call it) that are also sacred books of the Jewish faith. Our common heritage gives us the same foundation for our values. This is why we often hear of Judeo-Christian values. They have the same root. The Talmud, however, is not Christian. The wisdom of the Talmud comes from thousands of years of Jewish history and learning. It is a commentary on how to apply and implement the teachings in the five books of Moses, which Christians know as the first five books of their Old Testament. Through many generations of history the Jews developed the Talmud as a guidebook telling how to implement the things learned from the five books of Moses. Rabbi Ganz does a great service to the reader by telling us how this came about and the purpose of the Talmud. You don’t have to be Jewish to appreciate its wisdom and learn from its teaching. In fact, any person who truly wants to grow in their life understands that we learn much from the past and only the foolish reject learning from our predecessors. Rabbi Ganz has done us a service by giving us a glimpse of understanding from the Talmud. And I will say that while Rabbi Ganz and I may be of differing faiths, our views on the issues he raises are often quite similar. The biggest thing that stood out to me in reading this book was that Rabbi Ganz may be a better, more compassionate man than I am. The lessons you will learn in reading this book are both practical and thought provoking. The author takes numerous issues in the forefront of the news and addresses how they should be handled according to Talmudic teaching. Ironically the anti-Jewish bias throughout much of society today makes it less common for people to consider the wisdom of ancient Hebrew teachings today. When you do an internet search regarding such things as wisdom of the ancients the majority of results will initially be regarding Islamic teaching and then some Buddhist, Hindu, and other Eastern thought mostly comes up. But not much Jewish thought comes up. I am sure this is due to political correctness and the anti-Israel views of many today who are simply uninformed of the depth and greatness to be found in ancient Jewish teaching. It is common today to see people accept an uneducated and closed-minded view of Israel and its history. Rather, to appease the demands of political correctness many people find themselves buying into the false narrative promoted about Palestine and Israel’s history. This has caused a sad and great loss to those who have not been exposed to the great wisdom the Jews have to share with the world. The fact that the United States, the most prosperous society on earth that has offered more freedom and opportunity to mankind in world history is based on Judeo-Christian values should cause us to look to historical wisdom founded in those teachings. But our world is so sidetracked by preconceived and ill-conceived viewpoints of Jewish and Christian history that they virtually do intellectual gymnastics to avoid considering much of anything from either faith to be positive. It is a sad loss for the world to ignore and even abandon such teachings. 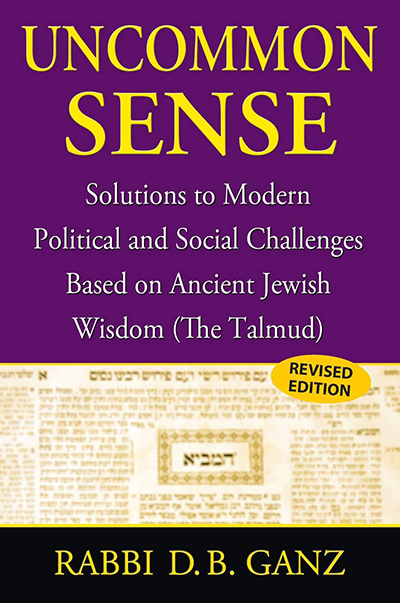 If you really want to understand where the values upon which our nation is based, you owe it to yourself to include in your reading a copy of Rabbi Ganz’s Uncommon Sense. It will enlighten you to logic and reason at a level you may never have been exposed to or considered. But even more important than understanding the foundation stones upon which our nation is based, understanding the things that books like this offer will help any individual’s development of logical and ethical thinking processes.